Reaper Lana Harvey is finding out the hard way. When Grim's new second in command, Jenni Fang, recruits her for a special mission, the biggest victory over the rebels is tainted by a crushing and immediate reprisal. The rebels have a new general working in the shadows of Limbo City, luring gods, reapers, demons, and souls to the dark side. Slow buildup, but worth it in the end! I began this series a year ago, with the bundle of Books 1-3. Though I neglected to review them at the time, as I recall, I was initially underwhelmed, and felt less hooked than I was accustomed to being with other series. (I believe I only purchased because there was a lull between releases of sequels to any of my regular favorite series, and three books for one credit was a pretty good deal.) So, I listened at a leisurely pace, just barely interested enough to keep at it, and not return for something else. But, somewhere along the way, I fell in love with the characters, and I realized I was thoroughly invested in the story. 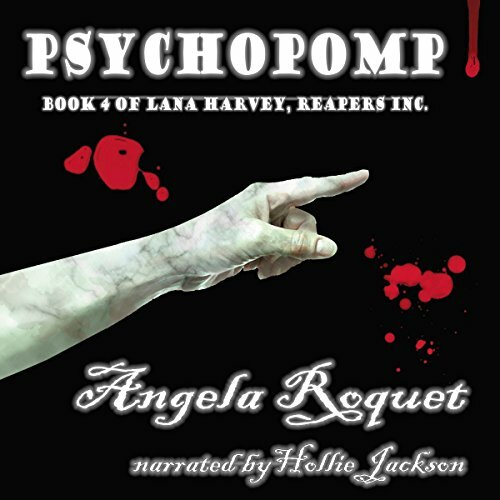 By the end of Book 3, I was a fan of Lana Harvey, and of Angela Roquet. I didn't immediately continue the series, but I knew I would come back to it eventually. So now, a year later, I have finally resumed, and, once again, it was a slow start. From the beginning, I felt like Book 4 was dragging, and, even though I still enjoyed the characters, the story itself just didn't feel lively (no pun intended). I actually thought I would wind up returning it, much to my dismay. Then, there was that magical shift again, and this story really turned around! By the end of this book, I was clamoring for more, and have immediately purchased the next one. If you are struggling to stay interested, keep listening! It really does turn out to be a great story! As to the narrator, I am always a fan of Hollie Jackson. I love the sound of her voice, and I think she does a fine job at characterizations. I do have one tiny grievance (but obviously not great enough to impact her five stars): I have noticed her pronunciation of the word &quot;having&quot; sounds more like &quot;haffing.&quot; It is a little jarring; once or twice, in fact, it was distracting enough that I had to rewind, because, instead of paying attention to the story, my mind got lost on the weird pronunciation. Other than that, she is one of my favorites! I did not care for the first book. At a turning point in the novel it became immersed in different religions and how they effected the management of the city. For each successive book that has become less prevalent. Lana has matured a lot in this novel. Her responsibilities and skills demand more of her and she delivers. You still have her one liners and her, "I can take care of myself". Her fight to take care of herself is no longer an issue. Eliminating the demon upraising severs friendships and loves, while renewing friendship and bonding unlikely pairs. This is an emotional roller coaster where all the characters are taken to another level. Don't mess with Grimm. His fury has no bonds. He is recklessly and relentlessly pushing everyone for results, NOW. "For the good of the cause" has a bitter sweet meaning. The sacrifices that are demanded are high and the satisfaction for the "cause" is fraught with guilt. That is where we leave Lana. She has fought for council members and been manipulated by the council from book one. Each book she is always the scapegoat for the council. Through council machinations and demand for secrets, Lana's world is torn apart. My favorite of the series to date. The main character still has the anti-hero vibe with the jokes and one-liners, but the overall story is more serious. Narration is spot on as usual. Great listen!